Just like in the old days of CS2007 and pre-R2, hit File > New Website and you’ll get the “New Web Site” wizard. 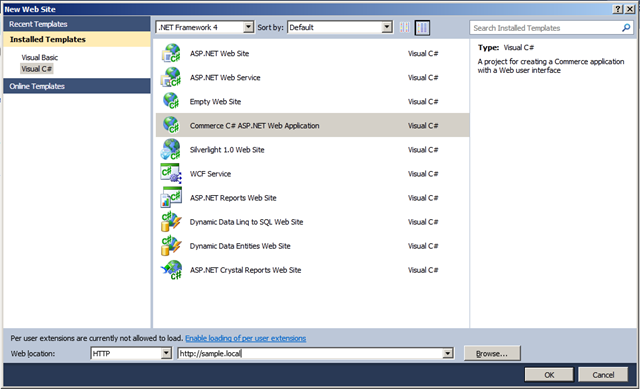 Select your language of choice (C# is the better one) and “Commerce C# ASP.NET Web Application”. Although for some odd reason, they’ve decided you can’t use the file system or any non-localhost url (like above), so at least when you first create the site you need to do so under localhost. 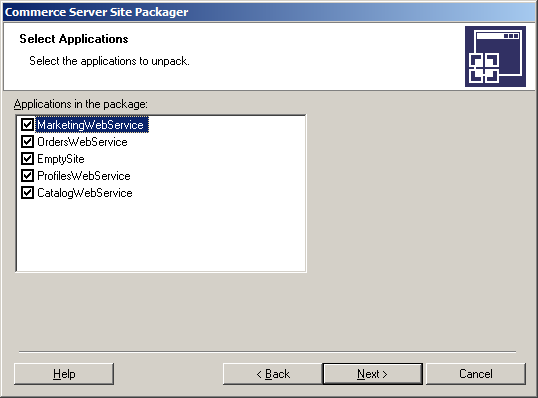 You’ll then have the Commerce Server Site Packager application pop up to unpack a default web site. This will ask for the site url, but not ask any of the good old questions like what you want to name the application directories, meaning you’re stuck with a crappy prefix on every directory it unpacks. Anyway, once that’s done you should have an unpacked beginning of a web site. If you go to this point without a couple of COM errors, then congratulations. But now you’ll also notice that the project created was a “Web Site” project instead of a “Web Application” project. So what’s next… oh yeah! Find another way to do it that actually makes sense. 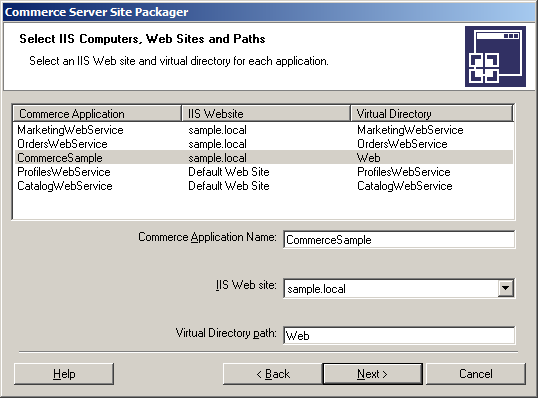 If you’ve been through the process of using the Commerce Server Site Package application to extract a site in previous versions of commerce server, then you’re not going to learn much here… nothing has changed! If you haven’t, please read on. Well if you’ve been through the Project Creation Wizard then you have two things up your sleeve, you have a good web.config to start from and a csapp.ini file that points to the original PUP file used to unpack the empty website. If you haven’t, then don’t worry – I’ve uploaded the Commerce Server 2009 Starter Files to my SkyDrive and I can tell you that the original PUP file lives at “C:\Program Files (x86)\Microsoft Commerce Server 9.0\Extensibility Kits\Samples\Pup Packages\empty.pup”. Now you can open the Commerce Server Site Package application manually at “C:\Program Files (x86)\Microsoft Commerce Server 9.0\PuP.exe”. It will ask you if you want to package or unpackage, but if you don’t have a site on your machine package will be disabled and unpackage will be selected. After hitting next, select the PUP file mentioned above and select Custom Unpack then hit next again. Then select create a new site and hit next. Now you need to type a name into Site Name text box that does not conflict with any existing sites and click next – e.g. CommerceSample. This name is used by your web application to identify which site resources are used by the application because Commerce Server allows you to have multiple “Sites” on a machine. Then you’ll want to unpack all the resources available and click next. Click next again to create the authentication and profiling resources. Now you will be setup all the database connections for each resource in the site. Selecting a resource and clicking Modify allows you to set all the basic connection details. 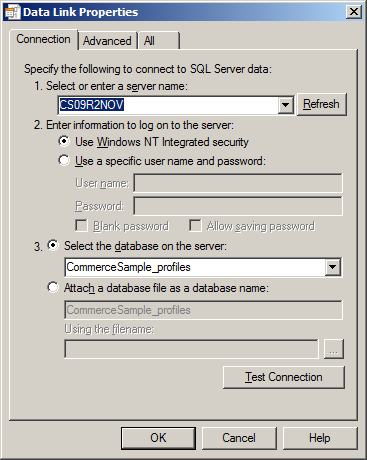 If you are using a remote database server, this is where you need to change the settings. 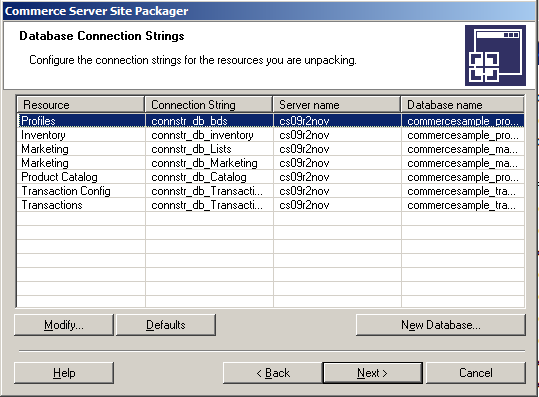 After modifying the connection strings as necessary and clicking next, you will be able to select the applications you want to unpack. Each Site is “usually” made up of 5 applications – a Marketing, Orders, Profile and Catalog web service and a Web app. After selecting them all hit next. You can now rename any or all of the applications and change the web site in IIS that they will be hosted on and virtual directory they will be under. After a few seconds, you will be asked to provide some scripts. Click next twice to skip this. After about a minute, you will be notified of whether the database connections were successfully set up. Click next to continue. You will then be notified of whether all the resources were extracted successfully. Click done. Now, to get the web config into the right place, find the location of the web application that was extracted and drop in the web.config. This folder will have 3 files in it before you drop in the config file– csapp.ini, OrderObjectMappings.xml and OrderPipelineMappings.xml. And that’s it! Well, not really… you now have extracted a Commerce Server web site, but it will not run. Now you’re in another world of pain called “Configuring a Commerce Server Site”. Want Open Search Integration in Your Website…? Over the past few weeks, Tatham Oddie, Damian Edwards and myself have been working on publishing a framework/toolkit for integration OpenSearch into any ASP.NET search enabled website. I’m pleased to announce we have finally hit a release! OpenSearch is a technology that already has widespread support across the web and is now getting even more relevant with Internet Explorer 8’s Visual Search feature and the Federated Search feature in the upcoming Windows 7 release. Now it’s time to make it even easier. Ducas Francis, one of the other members of my team, took on the job of building out our JSON feed for Firefox as well as our RSS feed for Windows 7 Federated Search. More formats, more fiddly serialization code. Following this, he started the OpenSearch Toolkit; an open source, drop-in toolkit for ASP.NET developers to use when they want to offer OpenSearch. Today marks our first release. So get on over to codeplex, hit up Tatham’s blog for instructions and drop the toolkit into your web site so you can take advantage of all the coolness that is OpenSearch. Implementing DiscoverSearchTerm isn’t that difficult either. We just have to analyse search engine statistics to see which ones are most popular and analyse the URL produced when performing a search. Luckily for us, most are quite similar in that they use a very simple format that has the search term as a parameter in the query string. The search engines I analysed included live, msn, yahoo, aol, google and ask. The search term parameter of these engines was either named “p”, “q” or “query”. // Remove the question mark from the front and add an ampersand to the end for pattern matching. The above code uses two regular expressions, one to filter for a search engine and the other to separate the query string. Once it’s decided that the URL is a search engine’s, it creates a collection of query string parameters that could be search parameters and returns the first one. Unfortunately, there wasn’t enough time in the iteration for me to properly match the search engine with the correct query parameter, but as is most commonly the parameter comes into the query string quite early so it’s fairly safe to assume that the first match is correct.